F. Wayne King et Russell L. Burke (éd. ), Crocodilian, Tuatara, and Turtle Species of the World. An Online Taxonomic and Geographic Reference (copyright © 1997 Association of Systematics Collections). Texte intégral disponible en ligne. James Perran Ross (éd. 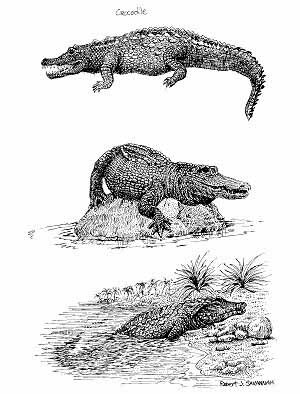 ), Crocodiles. Status Survey and Conservation Action Plan. Second Edition. IUCN/SSC Crocodile Specialist Group. IUCN, Gland, Suisse, et Cambridge, R.-U., 1998, viii + 167 p. Texte intégral disponible en ligne.